ROOKIE: New senior Cat Tom Atkins. Former VFL midfielder Tom Atkins is eyeing a move forward after snaring a rookie place at Geelong in 2019. 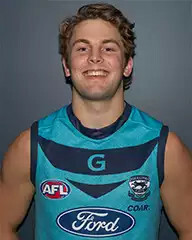 The Cats plucked the bullish 23-year-old with pick 11 in the rookie draft after he played five years in Geelong’s VFL side. Atkins had developed a reputation as a tackler but told AFL Media that the senior team’s fleet of midfield stars had forced him to look further afield for opportunity. Atkins has joined a long list of current and former team senior players with experience in Geelong’s VFL side. Teammates Tom Stewart and Ryan Abbott both earned their wings in the Cats’ seconds, while others to have starred after a VFL start at Geelong include returning Giant Shane Mumford and now-Melbourne head of development Matthew Egan.